Inulin (Not to be confused with insulin - with an s!) is a slightly sweet carbohydrate that has certain beneficial properties. It is classified as a fiber because it passes through the digestive tract without being metabolized until it reaches the colon. Unlike cellulose fiber (bran etc) it is a soluble fiber. It is found in many root vegetables particularly chicory. It has a good taste but very low sweetness. It is not really of any use as a sweetener on its own, but because of it's unique properties it is often used in combination with other sweeteners. Not much use as a sweetener on it's own, but it is sometimes mixed with other high intensity sweeteners, and marketed as a low calorie sugar substitute. In the food industry it is used to bulk up products, while keeping the calorie count low. Also used to provide fiber in health bars and snacks. Added to some infant formula for the health benefits. It has less than one third the calories of sugar. It has a zero glycemic index and is suitable for diabetics. It adds fiber to the diet. It is prebiotic and has been shown to promote the growth of beneficial bacteria in the colon. It has also been show to assist the body's ability to absorb minerals from food. It adds bulk and texture to processed foods. It also has medicinal properties. It has been shown to reduce high levels of triglycerides. These are fats which have been linked to heart disease. Also useful in the treatment of constipation, particularly in elderly people. It appears to help the absorption of calcium from food, and is also credited with boosting the immune system, which if true, would really place it in the 'superfood' category. Very detailed scientific information is available in the JN Journal of Nutrition which discusses the uses and health benefits of this substance as well as Oligofructose. Although it is not a sugar alcohol it has a laxative effect. It is a fiber and this can have beneficial effects but can cause cramps etc if consumed to excess. Probably best not to consume more than 30 gm per day. For this reason it is a good idea to be aware of its presence in processed foods and 'health foods'. For most people an upper guideline would be 30 to 40gm per day. It is an natural product found in root vegetables. Much of the inulin available commercially is obtained by soaking chicory roots is hot water. Not usually sold on its own but added to sweeteners, processed foods or health foods. A product called Olligo-Fiber produced by Cargill is available to the commercial food market and claims to be a natural product extracted from Chicory root. It is expensive. 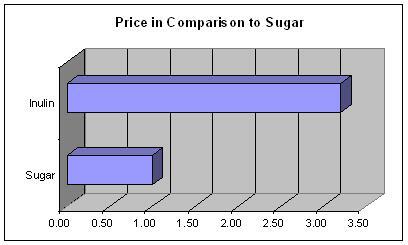 On the bulk market it is about 3 times the price of sugar by weight. It is only one tenth as sweet so it is over 30 times as expensive as a sweetener, though it is not usually used for this purpose. Tiny market share globally but growing due to it's health benefits and other properties. Inulin was discovered in 1804 by German scientist Valentin Rose. It is often found in plants with another prebiotic called oligofructose, which is similar with a shorter molecular chain. Both of these carbohydrates are soluble fibers meaning that they dissolve in water. They travel through the body undigested until they reach the colon. Here they undergo fermentation and this has a major effect on bacteria in the gut. It tends to promote beneficial bacteria but it also produces gas and can lead to flatulence. However, the body gradually adapts, and with long term use the benefits persist, but the undesirable side effects are reduced. Good sources are Chicory root, Jerusalem artichoke, Leek, Asparagus, Wheat bran and also Bananas. Agave, but not Agave Syrup is a rich source. Approved by the FDA as GRAS. Approved in most countries. Not much use as a sweetener on its own, but it is becoming more common as an ingredient in processed foods and health foods, yoghurts etc. It has many beneficial effects, however excessive consumption can lead to problems. Best to limit consumption to 30gm per day. Has medicinal uses and is said to boost the immune system.